Experts in feng shui—that ancient Chinese art of healthy interior design—say that the most important places in the home to keep clear and ordered are the entry and exit. 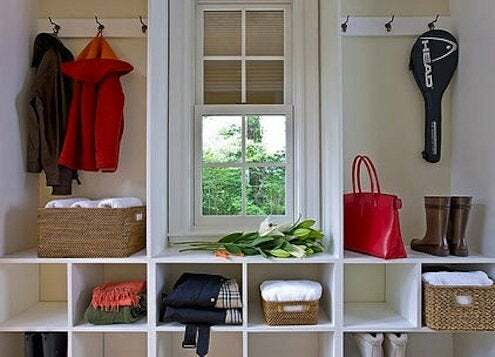 If yours are not, a mudroom project might improve the situation. Start by thinking about what gets dumped by the door: boots, coats, bags, keys, mail. Then design a designated spot for each. A simple shelf and a row of pegs over a bench with boot storage below might be all you need. If you need more structure, build in large cubbies with hooks and shelves for each member of the family to keep things straight. Add cabinet doors and you can hide these everywhere, front or back hall, basement, or even an inclosed porch. If you can’t build in, a simple chest of drawers or trunk for mittens and hats will do. The more super sturdy wall hooks the merrier, since that will keep things off the floor. A durable tile floor with a mat you can wash will help a lot—since they don’t call them mud rooms for nothing.